That’s a shorthand for episodic comedy that the premiere of the new Odd Couple takes full advantage of. Developed by a Must See TV veterans’ squad of Frasier hand Joe Keenan, Friends star Matthew Perry, and Mad About You co-creator Danny Jacobson (the third of whom didn’t follow the project to production), the pilot belabors some of the character traits, but it’s mostly “show, don’t tell.” Divorced sports writer Oscar Madison (Perry) performs pantsless radio broadcasts from an apartment decorated with sports memorabilia and rotting sandwiches. His new roommate, recently separated photographer Felix Unger (Thomas Lennon), keeps his pants on his legs (and crisply pressed) and wordlessly protects a bar table from Oscar’s perspiring beer bottle. Oscar will teach Felix to unwind a little; Felix will smooth Oscar’s rough edges. Repeat until syndication money rolls in. Unfortunately, the one element that’s not quite in place for the premiere is the other half of the central couple. Familiarity and an established rapport with Lennon—they previously palled around in the big-screen comedy 17 Again—do a lot of the heavy lifting for Perry in the pilot, as the star circles around the type of Oscar he’s going to end up playing. Perry’s an actor of some comic range, and the brightest spots of his last sitcom, Go On, displayed the type of vulnerability necessary to deal with The Odd Couple’s emotional underpinnings. But under the bright lights of the multi-cam soundstage, Perry’s Oscar Madison must contend not only with past renditions of the character, but a figure from Perry’s past as well: Chandler Bing, whose own neuroses made him Friends’ Felix to Joey Tribbiani’s Oscar. It’s a good challenge for the actor, but not one that can be overcome by some facial stubble and a New York Rangers T-shirt. Compensating for the messiness that Perry has yet to pin down, the premiere leans heavily on Oscar the divorced lothario, a guy who engineers meet-cutes through light mail tampering. 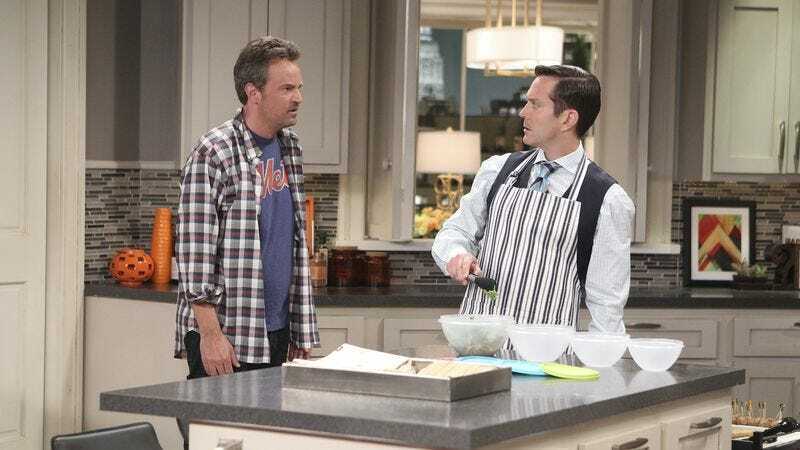 But the reunion with Felix makes Oscar realize how much he misses his wife (to be played by Gilmore Girls’ Lauren Graham), an emotionally honest vein that isn’t likely to be tapped because The Odd Couple is airing on CBS in 2015. (Then again, there is Mom…) Re-pitching the concept as Oscar And Felix: Alone Together would help bring this version of the story into the 21st century, but most of the contemporary flourishes in the premiere involve the types of things Jack Klugman and Tony Randall would have never been allowed to say to one another. Still, the Oscar-Felix gibing could be sharper, though at least one modern insult (prompted by Felix’s initials) makes for the best sight gag of the debut. One episode in, The Odd Couple has some of the humor, most of its cast, and all of its look nailed down. If it doesn’t manage to get its Oscar worked out, maybe the next Odd Couple will.